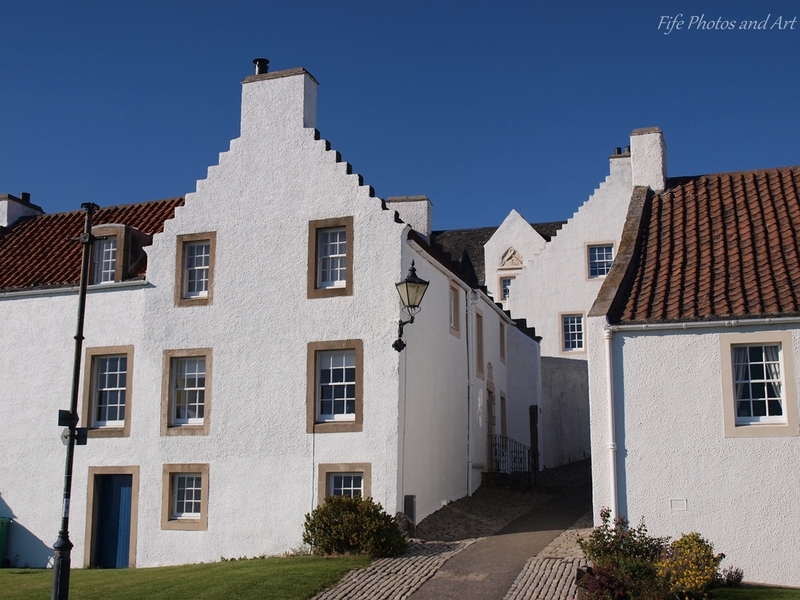 The name of the street on which you can find these houses in Dysart is called Pan Ha. It is derived from ‘haugh’ which means flat or level ground, and the ‘pan’ from the salt pans that would have been used here for many centuries. 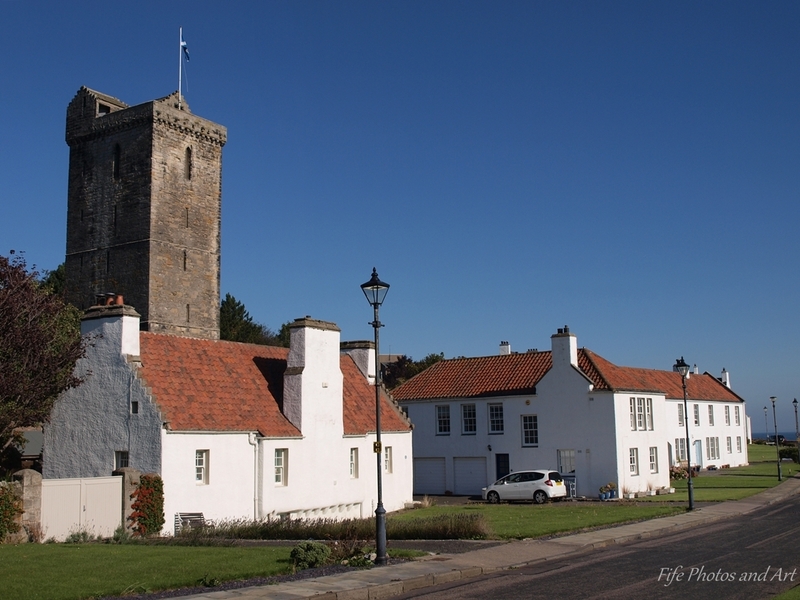 The salt industry (mainly used for food preservation) was an important process, from early medieval to Late Victorian times, on the south coast of Fife. Access to the sea, and to coal, were the two main factors that determined the locations of this industry. The sea water was placed in large pans, which were then placed on top of coal fires to evaporate the water to leave the salt in the pan. See “The Dysart Trust” page for an excellent old photo of Pan Ha, and a brief history of the area. This entry was posted in Architecture, Fine Art Photography, History, Weekly Photographic Challenge and tagged Dysart, Fife, Firth of Forth, industrial archaeology, Kirkcaldy, landscape photography, Scotland, Scottish history, Weekly Photographic Challenge, wpc. Bookmark the permalink. Interesting step design going up to the chimneys. I always loved those buildings in Dysart. Your photos definitely make great use of those blue skies and the strong light as the white of the buildings accentuates the shapes and the stepped gables in particular. You’re welcome 🙂 The staircase feature on the gable ends is called crow stepped gables, a peculiar feature to many older properties on the south coast of Fife! I totally agree, the Lake District is beautiful, as is some of their architecture. I’m a wee bit biased, I prefer Scotland and Cornwall, but the Lake District would be a close third!! Mind you, there are so many wonderful places throughout the UK, I think I would struggle to make a top ten, I would want to include at least 100 different places in it!! Lol! So you will know the walk around Loe Pool and the Penrose Estate 🙂 Many a happy hour I’ve spent doing that walk! And the Lizard is one of my favourite parts of Cornwall. It sounds like you know much of Scotland far better than me Lynne!! Lol!!! 🙂 I’ve never been to the Hebrides, and have only been up to the NW (Cromarty) once as a kid – it was that brief trip that made me always want to live in Scotland. As you say, most parts of Scotland are fantastic, there’s so much I want to take my wife to see. She’s from Glasgow, but hasn’t been up into the Highlands proper!! The white buildings against the vibrant blue sky is terrific, Andy. It is a rarity here to have a cloudless day! Everything looks so crisp and vivid in these shots. The architectural design of the buildings is unusual… very beautiful, Andy! An interesting bit of history and some lovely photos of beautiful buildings. 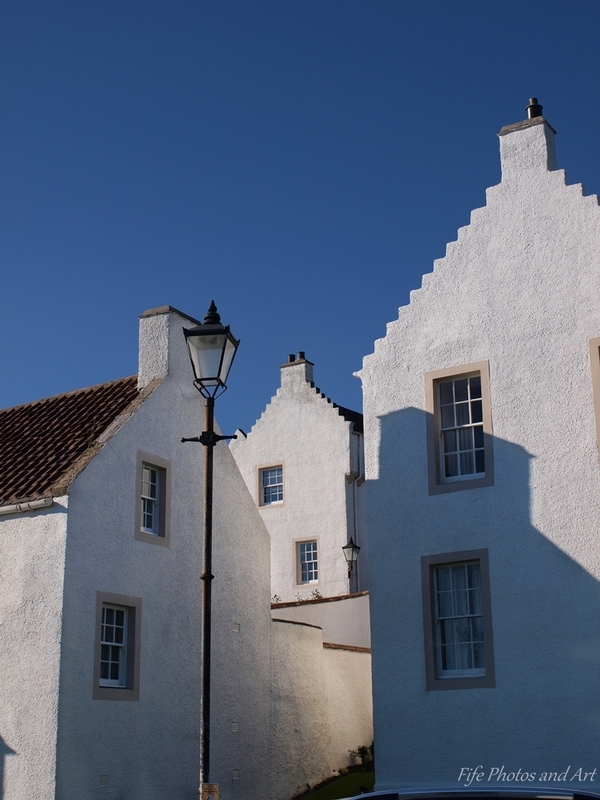 Were these restored under the National Trust for Scotland’s Little Houses renovation scheme, do you know? Thank you Lorna 🙂 And yes, I think they were restored by the National Trust for Scotland – that scheme is a great idea, because there have been so many beautiful buildings pulled down in the past, and horribly designed buildings put up to replace them 😦 I’m all for building affordable housing, but there should be some sort of restriction as to where they can be built! You’re making Scotland quite appealing! beautiful pictures! Love the houses so different! Yes I saw some on Millie’s page in her village and her history lessons and they are so cool! There are definitely some wonderful villages around Millie’s area, that’s getting into the land of thatched cottages etc 🙂 All very beautiful! yes I loved seeing around! Looks like a gorgeous place and how nice to see blue skies…. I forget what they look like!! It is a beautiful wee village Joy. Hopefully by the time you read this reply, it will have started drying up, and you will have seen some sunshine and BLUE SKIES!! The sun is actually shining today…. not sure how long for but that’s something! !